The new Ideal 4911 replaces the Ideal 50. It is an updated self-inking stamp that works and feels as great as they look. Their numerous patented features make them a pleasure to use. Just one impression and you will appreciate the ergonomic shape and heavy duty construction. The IDEAL self-inking stamps feature precision components for a smooth, quiet action and many years of trouble free operation. A full size visible label lets you choose the correct stamp every time. Make thousands of impressions without reinking! Ideal self-inking stamps are an excellent choice for your high volume stamping needs. They have been mechanically tested to over one million impression cycles. The new Ideal 4912 replaces the Ideal 80. It is an updated self-inking stamp that works and feels as great as they look. Their numerous patented features make them a pleasure to use. Just one impression and you will appreciate the ergonomic shape and heavy duty construction. The IDEAL self-inking stamps feature precision components for a smooth, quiet action and many years of trouble free operation. The new Ideal 4913 replaces the Ideal 100. It is an updated self-inking stamp that works and feels as great as they look. Their numerous patented features make them a pleasure to use. Just one impression and you will appreciate the ergonomic shape and heavy duty construction. The IDEAL self-inking stamps feature precision components for a smooth, quiet action and many years of trouble free operation. The new Ideal 4914 replaces the Ideal 200. It is an updated self-inking stamp that works and feels as great as they look. Their numerous patented features make them a pleasure to use. Just one impression and you will appreciate the ergonomic shape and heavy duty construction. The IDEAL self-inking stamps feature precision components for a smooth, quiet action and many years of trouble free operation. The new Ideal 4916 replaces the Ideal 5770. It is an updated self-inking stamp that works and feels as great as they look. Their numerous patented features make them a pleasure to use. Just one impression and you will appreciate the ergonomic shape and heavy duty construction. The IDEAL self-inking stamps feature precision components for a smooth, quiet action and many years of trouble free operation. The new Ideal 4918 replaces the Ideal 5780. It is an updated self-inking stamp that works and feels as great as they look. Their numerous patented features make them a pleasure to use. Just one impression and you will appreciate the ergonomic shape and heavy duty construction. The IDEAL self-inking stamps feature precision components for a smooth, quiet action and many years of trouble free operation. 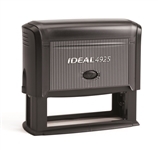 Ideal 4925 Self Inking Stamp 1" x 3-1/4"
The new Ideal 4926 replaces the Ideal 300. It is an updated self-inking stamp that works and feels as great as they look. Their numerous patented features make them a pleasure to use. Just one impression and you will appreciate the ergonomic shape and heavy duty construction. The IDEAL self-inking stamps feature precision components for a smooth, quiet action and many years of trouble free operation. Ideal 4927 Self Inking Stamp 1-9/16" x 2-3/8"
The Ideal self-inking stamps work and feel as great as they look. Their numerous patented features make them a pleasure to use. Just one impression and you will appreciate the ergonomic shape and heavy duty construction. The IDEAL self-inking stamps feature precision components for a smooth, quiet action and many years of trouble free operation.